They say many things about the Americans, but one thing that is true is that they love their cars - and they love accessorising them too. In-car technology, or telematics, is a thriving business in the Unites States. At the recent CES technology show in Vegas they showed-off dashboard TV screens to watch whilst you waited for a parking space. But other technology aims to make sure that you don't even have to wait. 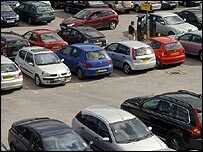 Big city car parks are often full, so one US satellite radio station is aiming to stream information about space availability directly into the cockpit. "There are hundreds of different parking garages spread across the United States where the garage owner has computer technology to tell them which spaces are empty or full," said David Butler of XM Satellite Radio. "We are tapping into that information and sending it to your navigation system. The map will tell you where the parking garages are located, and how many empty spaces they have." The Global Positioning System (GPS) is at the core of many in-car streaming information systems. One US device that relies on the technology is able to warn drivers about hidden speed cameras. It compares the location of the vehicle with a database of known camera co-ordinates. European drivers are already familiar with the idea, but the next step is to deliver more detailed knowledge about a car's environment to the person behind the steering wheel. "There are lots of kinds of visual information that we see happening in the future," said Dave Marsh of manufacturing company Cobra Navigation. "Things such as school zones, railway crossings, dangerous intersections, blackspots, those kinds of things. In the future those kinds of things will be detected by this kind of detector." You can also expect to see a lot more portable navigation units that are integrated with many other features in the car, from the CD player to Bluetooth devices. One snap-in, snap-out screen controls them all. "With portable on-demand we're able to have the full functionality of an AM/FM CD, Bluetooth, iPod capability, as well as a portable navigation system that we can take with us at any given point," said Ed Meenan of Eclipse. Probably the most important slot on your dashboard at the moment is the cigarette lighter and charger, but it is about to be joined by a USB port. Sync is a new joint initiative by Microsoft and Ford. Once your gadgets are connected by USB or Bluetooth, the system phonetically reads all the information in your gadget's database, which you can quickly access by simply talking to it using the latest voice recognition technology. Of course you can scrap the radio altogether and just rely on a petrol pump for your music - there are pumps that allow downloads into your car via wi-fi. So now you can pump and play songs at the same time. The end of life in the fast lane?